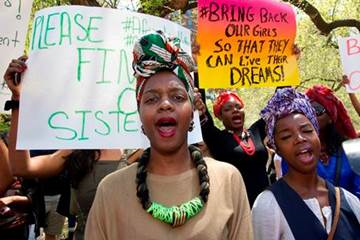 Abducted Nigerian Girls – What Took Us So Long to Care? Come to an all-African women’s panel on African Women in the Struggle for Social Justice – with speakers from the scholarly, academic, legal and media communities. The kidnapping of close to 300 girls from their boarding school in Nigeria galvanized the international community – not only over the cruelty of the kidnappers but for the almost unprecedented response by thousands of women who refused to let government to sweep another disaster under the rug. At this year’s Left Forum panel, organized by Global Information Network, speakers will shed light on this and other under-reported stories – the stories of women calling for justice, protesting corruption, demanding decent wages, working conditions, property and conjugal rights. What are the issues on the front burner for women around the continent, what has independence brought? How are traditional roles changing and has it been for the better? Join this important discussion organized by Global Information Network! Ms. Mpela-Thompson is a legal professional with experience in global trade law, HIV/AIDS rights advocacy and managing grassroots campaigns in sub-Saharan Africa. Ousseina Alidou – Ousseina Alidou is Associate Professor at Rutgers University-New Brunswick. Her research focuses mainly on the study of women’s discourses and literacy practices in Afro-Islamic societies; African women’s agency; African women’s Literatures; Gendered Discourses of identity and the politics of cultural production in Francophone Muslim African countries. Adeola Fayehun – The NY-based Ms. Fayehun works at SaharaTV, where she hosts “Keeping It Real With Adeola,” a weekly show that pokes fun at African politics while leveling a serious critique of its shortcomings. Frequent targets of her one-woman shows are the misdeeds of inept, corrupt and unethical politicians in Nigeria. Mojubaolu O. Okome– Mojubaolu O. Okome is a Political Science Professor at Brooklyn College, past Women’s Studies Program Director, UNDP Gender Consultant, now “Prof. #BringBackOurGirlsNYC”! organizing advocacy via Twitter and Facebooks. Betty Wambui – Asst professor in Africana/Latino Studies and Women’s and Gender Studies at SUNY Oneonta.Her areas of specialization include African Philosophies, Feminist Philosophies, Critical Race Theories and Critical Legal Studies. TIME: 3:40 – 5:40 P.M. This entry was posted in Uncategorized on May 29, 2014 by The Woman Hood.